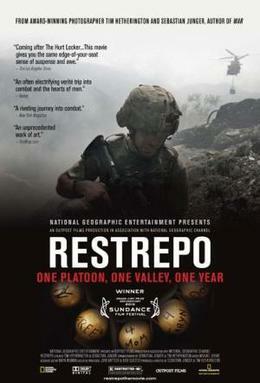 I watched Restrepo last weekend. It is a real life look at war in Afghanistan. Though the battles are scary, the soldiers seem to be well trained and used to being in battle. You see the effects war has on their minds and how the deaths of various collegues effects them. One thing you don’t see is the people behind the camera filming it all. Don’t know about you, but if I was in the middle of a battle with enemies shooting to kill me, I would want a REALLY big gun to fire back, not film it. This gives me the utmost respect for journalists that film and report on world events. It was 2003, and a stray, morbid thought crossed my mind one night in a hotel in Iraq. I was in a room full of twenty and thirty-something photographers and journalists, in the Al-Hamra hotel in Baghdad. A few miles away, the grown-ups from major label news organizations had filled the Sheraton-Palestine hotel – the Al-Hamra was the low-rent downtown spill over tent. I used to call it Melrose Place Baghdad, and in the evenings, after day trips to bomb sites and mass graves, the pack would convene at the poolside for blurry nights fueled by bad Lebanese wine. In retrospect, those days felt like the proverbial fun and games that preceded the losing of eyes. As it turned out, the first to die from the Al-Hamra scene was Marla Ruzicka, a 28 year old aid worker-activist. I’d first met her on another drunken bender in Kabul, a year earlier. She was killed in Baghdad by a vehicle-borne suicide bomber who plowed into the military convoy she was driving with. Many more died in the years that followed. via Which of Us Dies First?. I don’t think I’d enjoy the film…it’ll probably make me depressed and that’s not good. It’s brave sometimes bordering on madness to do what these journalists do, but I guess some one has to do it no? I did watch Triage though!